Turns out, I still know how to cook. Who would have thought? I made a promise to Andy that we’d start planning out our meals for the week. So I had us schedule out pasta dishes, chicken with veggies, and even a taco night. Well, when it came time for me to make the meatloaf I had planned all week on making, I took the ground beef out of the fridge, only to find it was still frozen. I scrambled, searched through the cabinets looking for an alternative. I couldn’t swap it for another day, those had frozen pieces to the meals as well. So I boiled some potatoes, threw some broccoli into some boiling water. Then I went through the freezer and fridge and found some frozen meatballs. Ok, I can work with this. The only issue was making gravy. I didn’t have any drippings to work with, so I lucked out with some beef bouillon cubes. Andy loved it so much, that he’s asking me to make it again. Wahoo! That’s a win for last minute meals that were basically a throw in the pan and hope for the best! In a large saucepan, add water and bouillon cubes. Heat on medium-high heat until cubes have dissolved. In another heated pan, add margarine and flour. Stir to combine and cook until flour was thickened, creating a roux. Slowly add beef broth mixture you just created. Stirring to combine. Add 1 teaspoon of garlic powder, and 1/2 tablespoon of black pepper to gravy. Continue cooking and stirring until gravy as thickened to your desired consistency. I usually let mine boil a bit while stirring to quicken the process. Add frozen meatballs to gravy and cook for another 8-10 minutes, or until meatballs are cooked through. Top over mashed potatoes, and serve with a side of steamed broccoli. I have completely fallen off the blogging map. I’d like to say that I really don’t have time for this anymore, but to be honest, I could be taken the time to write more. See, when I had to change jobs recently, it opened up a ton of free time for me. That time, however, has been put to use advancing Andy and my company and spending more time with Andy to strengthen our relationship. That should be a good thing, right? Well, it is, and it isn’t. You see, I love writing. I’ve been carrying notebooks around with me lately just to jot thing down. And I haven’t been taking good care of us for dinner lately with all this new business stuff taking over our lives. Andy and I have been so consumed that I’ve given in to those frozen quick meals. Not a great alternative when fresh food is available. But when you know you have a case of candles to make, wooden signs to paint, and wooden teethers to cut and sand, time is precious. So on Saturday, we sat down and actually made a grocery list and then planned out our dinners for the week. We haven’t done that in months! Monday was tacos, but last night I made this pasta dish with kielbasa and peas. I didn’t make the sauce from scratch, but I did take the time to revive the Prego sauce I bought. Baby steps, folks, baby steps. In a large sauce pan, add 1/2 tablespoon of olive oil to the pan. Heat on medium. When pan is warm, add kielbasa. Saute until meat is browned, stirring occassionally. Add 1/2 teaspoon of cayenne to meat, stir to combine. Cook for another 2 minutes. Add Prego, 1/2 teaspoon of sea salt, 1 teaspoon of ground black pepper, and frozen peas to the pan. Continue stirring to combine. Cook until peas have thawed, about 8-10 minutes. In a large bowl, add cooked pasta and sauce mixture. Combine everything until pasta is completely coated. Top with freshly grated Parmesan if desired. Serve and enjoy. I was going for something original. Something no one had had before. Okay, let’s be honest, it was an accident. I was starving, had only a few things in the house and ran out of bread. But on the bright side, I did make something that I think I would actually go out and buy the ingredients for to make again. Made for an excellent pre-lunch snack (read: second breakfast) and is technically Paleo. What? Paleo and tastes good? Yup, no bread in this BLT. In a medium-sized skillet, cook bacon until crispy. Remove cooked pieces from pan and let cool on a paper towel (which will also soak up some excess bacon fat). Remove most of the bacon fat and place skillet back on the stove. Add sweet potato and cook on medium heat until crispy. This can take 10-15 minutes. Stir occasionally. Chop bacon and add to a bowl. Add sweet potato, diced tomato, and roughly chopped iceberg lettuce. Add salt and pepper. Toss and enjoy. So I’ll admit it, I’ve clearly fallen off the face of the Earth this summer. I set my blogging aside to work on My Country Story, my new job, and just simply enjoying the summer. It’s been crazy how much has been going on that I haven’t shared with everyone. From photographing weddings, to photo shoots with friends, to expanding Andy and my business, things have been nuts. I haven’t even really had any time to cook. Plus, the extremely hot weather has not made it easy to stand next to a hot stove. 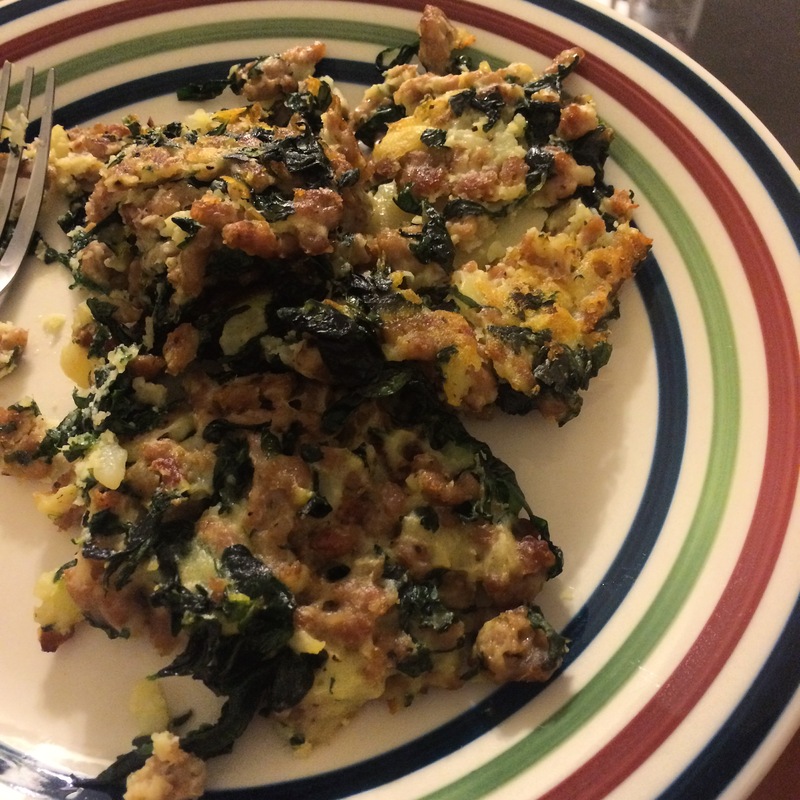 I did, however, make these fantastic sausage and spinach potato cakes, though. I had run out of food in the house, panicked, and put everything I could find together in hopes that it made something edible. Turns out that when you try to make twice baked potatoes and fail, there’s nothing wrong with turning them into cakes. Hey, not everyone can smoothly scoop out potato halves without destroying them. I don’t quite have that finesse, I guess. In a large saucepan, cook ground sausage until browned. Remove from pan, set aside, but leave any cooked fat in the pan. Add spinach to the pan and cook for 5-7 minutes, or until spinach has wilted. Wash and poke holes with a fork into potatoes. While still damp, place them into the microwave and cook for 8-12 minutes, or until potatoes are soft and cooked through. Remove from microwave. oss one more time until egg is combined into mixture. Form potato mixture into palm-sized balls, then flatten to about 1 to 1 1/2 inches thick. Place on a cookie sheet and cook for 18-25 minutes, or until cakes are slightly browned and cooked through. Let cool and serve.